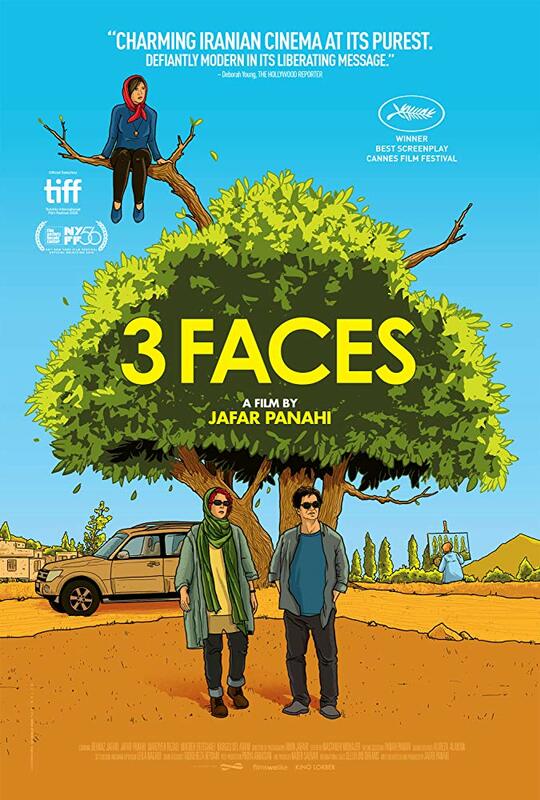 "3 Faces," a film by renowned Iranian director Jafar Panahi, opens today at select theaters in Los Angeles, San Francisco, Encino and Hartford with screenings in other cities to come. NEW YORK, October 9, 2018 - Prior to the October 8th US premiere of master filmmaker Jafar Panaji's latest film, 3 FACES, at the New York Film Festival, his friend, Iranian-American film scholar Dr. Jamsheed Akrami, took the stage to deliver some introductory remarks to the packed theater at Alice Tully Hall as well as a statement from Mr. Panahi himself. Mr. Panahi-director of such internationally acclaimed films as The White Balloon, The Circle, Crimson Gold, and Taxi-was unable to attend the screening of 3 FACES, winner of the prize for Best Screenplay at Cannes, as he has been banned by the Iranian government since 2010 from directing films or leaving his native country. Despite these restrictions, he continues to make movies and 3 FACES, a poignant yet playful exploration of oppression, is his fourth film since being banned from filmmaking in Iran. It stars Panahi and well-known Iranian actress Behnaz Jafari (both playing themselves) as they embark on an eventful road trip to the rural northwest of Iran to find out about the fate of a girl whose family has forbidden her from attending a drama conservatory in Tehran. They soon discover that the local hospitality is challenged by a desire to protect age-old traditions. "Thank you for coming to see an Iranian film by Jafar Panahi. Unfortunately Iranians living in Iran don't have the same opportunity because Mr. Panahi is officially banned from making films in Iran so his films are not shown there. Not only he is banned from making films, he is also banned from leaving the country, which explains why he is not here tonight, or wasn't present at Cannes Film Festival a few months ago to receive the award for Best Screenplay. What led to the ban following a 3-month detention was Mr. Panahi's activism in support of freedom of expression in Iran. In the parlance of the Islamic Republic that kind of activism is translated as "acting against national security" or similar bogus charges, which led to Mr. Panahi's imprisonment for 3 months in 2010. 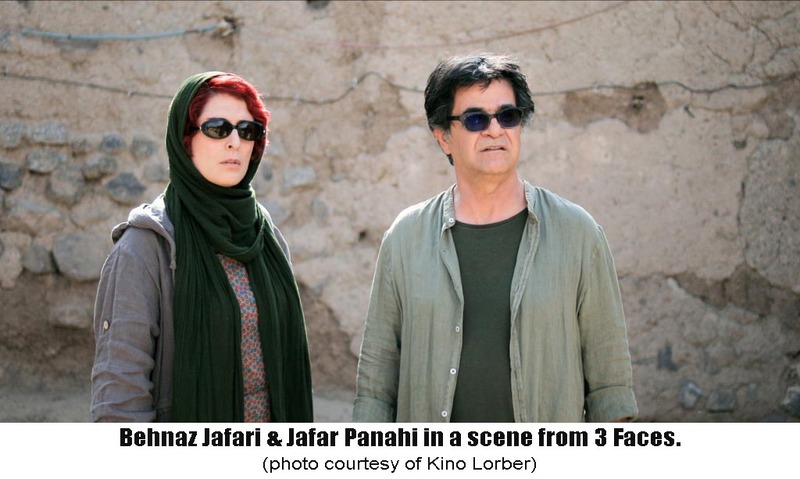 But even before 2010, the Iranian government had shown little tolerance for the kind of socially conscious films Mr. Panahi was making, and repeatedly accused him of showing the country in a bad light in movies like The Circle, Crimson Gold, and Offside, which is why those films were never shown in Iran and were also deprived of opportunities such as Oscar considerations despite their artistic merits. This year, it was "3 Faces" that lost that opportunity. Nothing against the Iranian entry, "No Date No, Signature" which is also a very good film. But the problem is Mr. Panahi's film was not even considered, and that's not fair play. You might be wondering if Mr. Panahi has been banned from making films for the past 8 years, how come he has managed to make 4 films over that period. Well, with great difficulty, Mr Panahi will tell you. The authorities are obviously aware of his films. Why they don't stop him? It's partly because Mr. Panahi makes his films surreptitiously and partly because his detention in 2010 caused an international uproar. In their damage assessment, maybe the authorities would rather turn a blind eye to Mr. Panahi's violation of the ban than causing another international embarrassment by arresting him again. " "I would like to thank the New York Film Festival for selecting my film, 3 Faces, for screening in the festival. I'd also like to thank Kino Lorber for distributing the film. I hope they won't regret their decision! I am especially thankful to my dear friend Dr. Jamsheed Akrami who has always supported my films in the United States. I was invited to the New York Film Festival in 1995 with my first film, The White Balloon. At the time I could never foresee that there would come a day when I would be barred from attending a festival by my government. I would have loved to be present and see how an American audience would react to my film. I am still so grateful that my films continue to be shown in many countries. Sadly I cannot say the same thing about my own country. Only my first film was publicly screened in Iran. Unfortunately, none of my following 8 films received screening permits. Despite the obstacles that I was facing after the ban, I kept telling myself that I couldn't give up and had to find a way to keep working. I am not alone. Many other Iranian filmmakers work under difficult circumstances. But instead of quitting or complaining, they persist and still make their films despite all the hurdles. Their determination to keep working against the odds makes me so hopeful about the future of Iranian cinema." Dr. Jamsheed Akrami is a scholar of Iranian cinema. A former editor of Iranian film magazines, he has published extensively, presented numerous lectures, curated film series, and produced a number of films, including the feature-length documentaries The Lost Cinema, on political filmmaking under the Shah, and Friendly Persuasion, on Iranian cinema after the 1979 revolution and 2018's A Cinema of Discontent, which completes his documentary trilogy on Iranian cinema. The films were screened in international film festivals and enjoyed theatrical runs and television screenings in the US and Canada. They are distributed by Kino Lorber.